For the newest in our series of Q and As with the AFDP Global team, we picked the brains of Director of Communications, Shimon Cohen. Read on to find out about his role in the launch of AFDP Global, his long working relationship with its founder, and his thoughts on how the story of AFDP Global will grow and reach more people. Shimon, you have known and worked with AFDP Global’s Founder, His Royal Highness Prince Ali of Jordan, for some time and seen first-hand his passion for football as a force for good. Can you tell us a bit about this background and how you came to be involved in AFDP Global? Working with Prince Ali is an awesome privilege. I worked on his election campaigns at FIFA. We didn’t win but we changed everything. Prince Ali talked openness, clarity and honesty. He reminded the world of sports governance that sport is about players, about inspiring people, and about opportunity. In everything he does, his passion shines through and it’s incredibly energising and motivating to be around. Of course, when he asked me to be involved with AFDP Global, I immediately understood the passion and vision behind it and jumped at the opportunity. AFDP Global has at its heart HRH’s message that on a football pitch there is no need for a common language; the game becomes a real language of communication in itself. That is the power of football distilled to its essence. Football has the unique ability to unite, bond and build. What Prince Ali has achieved with his ability to see football as a force for good is truly remarkable and AFDP Global is the platform to take this work to the next level. It’s been a busy first few months for AFDP Global. What are some of your personal highlights? It has to be completing the world’s highest urban zip wire at up to 80 km/h whilst at the Asian Cup in the UAE. Talk about a high-wire act! Seriously though, the last few months have been a whirlwind of networking, spreading the word and slowly but surely building support. 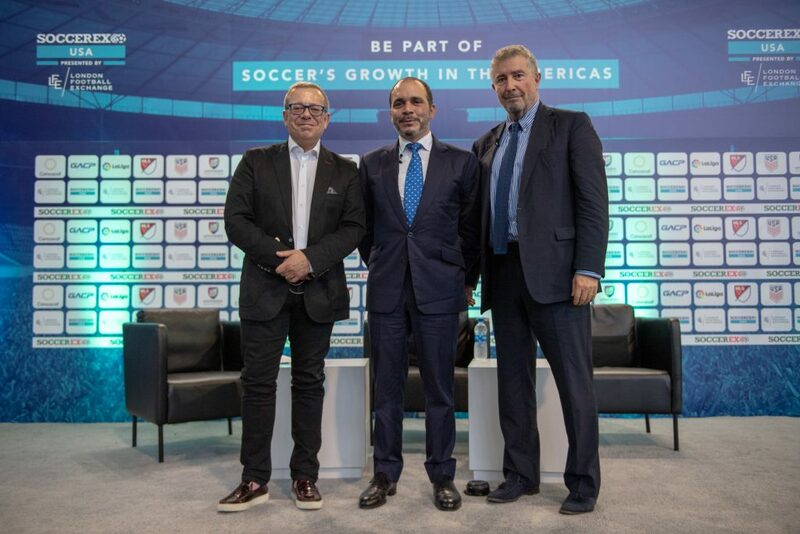 We presented at Soccerex in Miami, attended the Leaders in Sport Awards in London and the Asian Cup in the UAE. We have met with FA presidents and officials, NGOs and Foundations from many different regions, all with a common interest: to make a difference. But the stand out is the Roundtable that HRH called to discuss the awful crisis with women’s’ football in Afghanistan. That was a really inspiring day. Pretty much everyone who can help responded to Prince Ali’s call and joined us at the AFDP Global office in London, which led to some concrete recommendations. Even the fact that it happened made a clear statement in itself! As Director of Communications, who do you see as your key audience and what are the messages about AFDP Global that you want them to hear? Our key audiences are the worlds of business and NGOs, governments and football bodies. The message to them is clear: football breaks down barriers, encourages communication and builds communities. Prince Ali is the man who has assembled a team that can build on the excellent work already underway across the globe and deliver real change in disadvantaged communities. Whether it’s through a Facebook post, an image on Instagram, or an in-depth feature piece on a TV news channel – that is the story we want to tell. Has it been a challenge to differentiate AFDP Global from other organisations in the football ‘space’? There are so many motivated and committed people and organisations doing wonderful things with football right the way across the globe. They have nothing to fear from us. We want to work with them and help them to change even more lives – in concert rather than in competition. By pooling our experience, our expertise, and our know-how, we can have an even greater impact. We hope that this is good news to others working alongside us, and even better news for the people who they help and who could benefit from our partnership. When you look a year or two years ahead, what is the story about AFDP Global that you hope to be able to tell? When I look back on that wintry October day, when we launched AFDP Global in front of an expectant audience at London’s Emirates Stadium, my hope is that we can capitalise on that excitement and the enormous goodwill that we were shown by so many on that day. Already we are well on our way to realising our global ambition and exerting influence. In time, I would like to be able to use different examples from all over the globe to show how football can, literally, empower and bring communities together and improve lives. The horrors facing the women in Afghanistan should be over and people should have been brought to justice and AFDP Global will be leading the world as a testament to how football truly can bring people together, even under the most adverse circumstances imaginable. Want to read more from our team? Click here to read previous ‘meet the team’ Q and As with Amanda Vandervort and Rick Parry.